Resin Research is the first choice for all marine construction users. How to use Resin Research Epoxy Resin. The world’s best Epoxy Resin by far, with a high bio content and ease of use, Resin Research is the first choice for all marine users. Advanced chemical makeups, strong UV resistance, tough, ultra clear, safe and clean, this is the choice of advanced marine engineers and laminators world-wide. Best Practice for Laminating in Epoxy Resin. Similar instructions apply to all marine craft. See the video on RNLI Rescue Board Production at Seabase. Use Resin Research 2000CE Ultra or Kwik Kick Ultra for laminating. We recommend 2100F Hardener for the 2000CE ultra resin. Kwik Kick Epoxy has a different Hardener. Use 2000CE ultra Resin for installing posts, stantions, boxes, or plugs with 2100F hardener. Slow hardeners cause drainage, and may not cure fully before the required time. However, high concentrations of resin may cause increased temperatures. (exotherm). We supply slower hardeners (2100S, 2100X) for mixing with Resin Research 2000CE Ultra Epoxy to reduce the exotherm (heat output) when using large quantities in enclosed areas. Ask for further advice if unsure. See the mix ratios by volume and weight here. All base materials suitable for epoxy, including marine surfaces, wood, PU or EPS blanks or any unsealed surface (wood, EPS, styrofoam, concrete, balsa or PU) must be completely grease free and dust free and any paintwork or sealer/filler completely dry. Use tack rags, or wipe surfaces with denatured alcohol. Always ensure any smooth surface is abraded for adhesion. The room working temperature should ideally be 24 Degrees Celsius (24º C) or more. EPS and PU foam or blanks, or any porous product, should be at the ambient room temperature or higher for 24 hours or more before glassing to avoid gassing. The resin and hardener must be kept at an elevated room temperature 24 hours before beginning. If Part A is cold and thick, unscrew the lid and warm the A component, the Epoxy Resin, in a microwave oven for 20 seconds then add the B component to the warm resin. Be careful – it may react quicker as a result. Alternatively, leave the resin in an elevated temperature place for 24 hours or more. IMPORTANT. If the resin appears unusually thick or crystalline, the resin is still perfectly usable and is not bad. See the article here on how to recover the resin. If pigmenting, use a totally compatible pigment or a tint. Add the pigment to the Part A at the recommended rate. 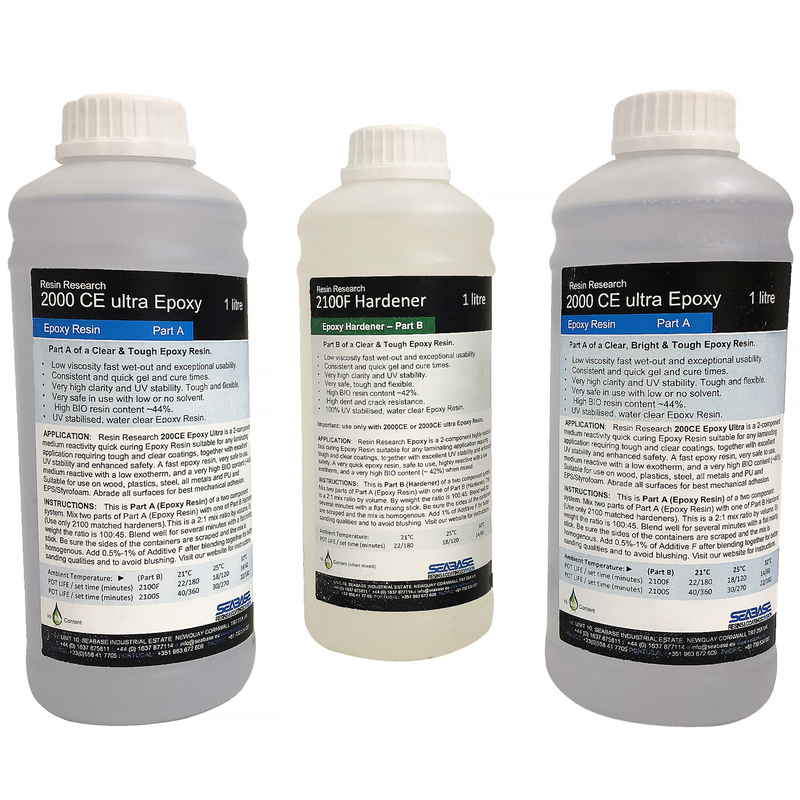 This may range from 2% for tints, to 10-15% (maximum) for solid Epoxy pigments. Do not use Polyester Pigments in Epoxy. This volume of Part A and pigment will need the required rate of hardener. Do not guess. Measure accurately or the pigment may cause the epoxy to remain soft. Measure precisely two parts Resin (Part A) (excluding Additive F) to one part Hardener (Part B) i.e. (2:1) by volume. The mix by weight is 100:45. Use a graduated pot for best results, or weight separately. (See the Mix Ratio chart here for the weights and volumes required). Use separate plastic measuring jugs and keep them apart. We suggest you need 750 ml of mix per layer per side per board. A 3-litre pack should do a small surfboard. You may need, or use, more or less. Blend the two products in a fresh or clean container by stirring with a flat stick for at least one minute. (The flat stick is vital – see the video). Scrape the sides of the mixing container frequently. Do not frappe or introduce air into the mix. Leave to stand for one minute to aid the release of air and to help the hardening process. Spread evenly and quickly over the base material (wood, fibreglass, aramid, carbon, flax etc) using exactly the same techniques you would use for Polyester Resin, but using a plastic spreader, not a squeegee. Spread evenly but do not pull out too much resin. Aim for a 50/50 resin/fibreglass balance if possible. The resin should remain usable for 15-20 minutes at 25º C.
The surface can be turned or re-coated after 2 – 5 hours, depending on temperature and humidity. Remember, if laminate is still slightly tacky, use tape beneath the surface before flipping. Always re-coat with another layer within 12-18 hours – do not leave to fully cure to ensure a chemical and physical bond. If the resin has fully cured you may get rejection from the lack of a physical key. Sand within 24 hours of the final coat. Resin Research Epoxies cure hard and tough. If you are glossing, do so within 24 hours of the final coat. Do not use Additive F in anything but the gloss coat, if glossing. The gloss coat may be rejected if the sand coat resin with Additive F has cured. You can polish the Sand Coat directly if it is a sound, flat surface. Polish, or coat with acrylic, Polyester gloss, or speed coat. (See How to Gloss instructions for Epoxy). A full multi-layer laminate reaches full cure after 24 hours at elevated (35º C+) temperatures, or after 7 days at room temperature. These instructions are offered in the best faith but may not be correct under different conditions outside our control. We strongly suggest you adapt these instructions by sampling to suit your own conditions and circumstances.